Even after your business starts earning money, it can be tough to get past the poverty mindset. Here's how I did it. Marie Incontrera, Artist in the business world; businesswoman in the arts world. My skates taught me an important lesson about money. Being an artist taught me how to stretch a dollar. I spent my twenties building a career with my band, the Eco-Music Big Band, as a starving artist. I learned how to split $500 15 ways, found all the best thrift stores in Brooklyn, and discovered that it’s really possible to become a major contender in the NYC avant-garde jazz scene without really making much money. I took any job that I could find – often grossly underpaid – in the name of my art. And I loved it. Starving artist is a term that might as well be a bronze medal in the art world – we toil and struggle for our gifts – and living simply is a badge of honor. As I neared thirty, I knew that I wanted to create more, both in my art and in my life. I’ve been working as a consultant for just under two years and have seen my income grow exponentially. As I near the exciting and once-unimaginable six-figure mark, I suddenly have more disposable income and more free time to create the life that I want. I enjoy being able to consult with businesses, thought leaders, and individuals; I also enjoy being able to scale up my arts projects (earlier this year, I was able to bring my band to the Carnegie Hall stage) and discover new hobbies. My good friend Jessica innocuously invited me to a Gotham Girls Roller Derby championship game late this summer. I had never been to a roller derby game before, but I loved the movie Whip It, so I decided to go. I promptly fell in love. Roller derby is an odd mix of skating, football, martial arts, and track and field; so, the very next day, I signed up for the Gotham Girls recreational league basic skills classes and set out to find skates. This is where the poverty mindset comes in. Instead of carefully doing my research on the kind of quad skates that would be best for the sport, I purchased the cheapest skates I could find online ($80) and headed to class. I’d heard that derby could be an expensive sport and was determined to beat them all at their own financial game. I liked my skates well enough – I’d tried them out at a roller rink before the class started and knew that I could go forward and around the track without falling. What could be so different about my skates? The first week of class, I discovered that my skates were big and cumbersome next to everyone else’s. My boot went past my ankle and restricted my movement, while my classmates had what looked like sneakers at the top of their wheels and were able to move freely. My wheels were bigger than everyone else’s, and my toe stops were painful to use. I went to the skate shop and spent $100 on new wheels and went back to class. As the skills got more advanced, I discovered that there was more that my skates wouldn’t allow me to do. As my classmates were able to turn and skate backward, I found myself at an embarrassing standstill on the track, trying and failing with all my might to get enough of a push on my front two wheels to get going, because there wasn’t enough support in the bearings that held the wheels and the boot together. So I went back to the shop. New skates were $180. 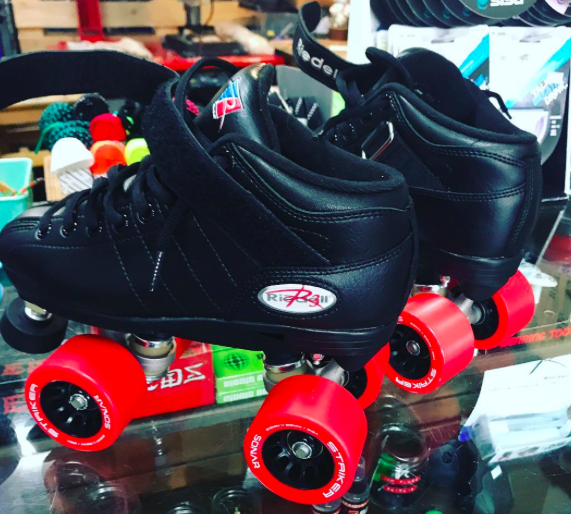 I was shocked to learn that derby skates were just $100 more than what I’d paid originally for my skates; and I’d had to spend $100 anyway to replace my wheels. I hadn’t done my research because I’d assumed that proper skates would be too expensive for me, and I’d wasted valuable class time trying to navigate in the wrong skates. I got down on myself pretty hard for a moment, until I realized that I had approached this new hobby and skill from a poverty mindset. I knew that if I’d approached something at the >$500 level with the poverty mindset, then I must be utilizing it elsewhere in my life. Sure – I no longer needed to subsist on ramen noodles and peanut butter sandwiches, and could afford to try new hobbies, but I still approached life like it might be too expensive for me. 1) Investment. No, I’m not just talking stocks. I’m also talking about not buying a phone case because you want to save $40 when you’ve spent $700 on the latest iPhone. (Yes, this is me.) Or buying the wrong skates because you might save a little bit, but having to put more money into the cheap skates and then buy the better skates anyway. Or buying the lowest level insurance because you’ll save monthly, and what are the chances that something’s going to happen, anyway? (Also me.) It turned out that it would have been worth it in the beginning to just go to the skate shop and consult the experts, just as it would have been worth it for me to buy a phone case. 2) Fear. Yes, it’s scary to scale up. When I had to pay labor costs for our Carnegie Hall show, I had to write a five figure check. I’d never done that before, and even though I had the money in my account, I found myself shaking and sweating as I wrote it. Humans are creatures of habit, and we don’t like change – even when change is good. It helps to have a financial cushion, but it’s even more important to have a 360-degree view of what your financial situation is. A logical and mathematical understanding of your finances may not silence the survival mechanism of fear, but it can at least set your mind at ease! Oh, and, I love my new skates. Turns out I’m not so bad at this roller derby thing! Marie Incontrera is a social media, publicity, and speaker consultant; jazz musician; and fitness enthusiast living in NYC. She is the founder of Avant Consulting, and is the bandleader and pianist of the award-winning Eco-Music Big Band. In her spare time, she can be found on the roller derby track or in a yoga class.